Nowadays the maintenance of “a nice smiling” represents the main desire of our patients and the request for tooth colored restorations is very high. Predictable and repeatable results can be achieved through materials and clinical practices that, on one hand, preserve the original structure of the compromised tooth and, on the other hand, involve a very low biologic price. New technologies for the enamel-dentinal adhesion and the continuous evolution of more sophisticated esthetic materials as composite and porcelains allow the effective reaching of verifiable and predictable results. Technologies and materials have to follow an operative approach that strictly involves operative steps which have been carefully codified referring to the materials typology used from time to time. Unfortunately many times, too many times, in Congresses, Courses, Social Networks, such as Facebook, that should be correctly called "Facetooth", we are assisting to something that could be referred much more to “a dental show” than to “the dental medicine”! People seem to be more concentrated on the quality of the images, the definition of the movies, showing very often “seductive minimally invasive” clinical cases that do not respect the fundamentals of operative dentistry and many times hide a lot of mistakes behind the word “ADHESION”! This lecture aims to point out the relevant guidelines in both direct and indirect techniques for esthetic restorations through the evaluation of techniques and materials in order to reach correct, standardized and long lasting evidence based clinical results. 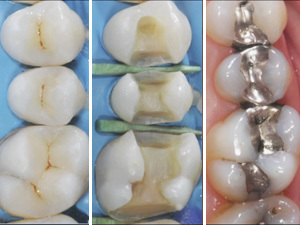 1) Highlight the relevant guidelines in both direct and indirect techniques for esthetic restorations. 2) Emphasize the clinical pillars of today’s biomimetic approach utilizing minimalist preparation and optimal preservation of tooth structure while, at the same time, respecting the fundamentals of operative dentistry. 3) Discuss the science of new adhesive and material technologies that better allow clinicians to achieve the goals of minimally invasive restorative dentistry. Predictable and repeatable results can be achieved through materials and clinical practices that, on one hand, preserve the original structure of the compromised tooth and, on the other hand, involve a very low biologic price. This lecture aims to point out the relevant guidelines in both direct and indirect techniques for esthetic restorations through the evaluation of techniques and materials in order to reach correct, standardized and long lasting evidence based clinical results.